Found a bug? Feature request? This is a tiny plugin I wrote to use the new native tagging from WordPress 2.3 to automatically create a meta-keyword-tag for articles and pages on my blog. It creates the meta-keyword-tag for other pages of the blog as well. The current version 0.6.4 is available for download at the WordPress plugin directory. There is a support-forum for this plugin. The only thing you need, is a running installation of WordPress 2.7 or later. With WordPress 2.3 a new native tagging-feature was introduced. I needed a plugin that would allow me to use the new tagging for the meta-keywords as well. Unfortunately, I couldn’t find one, so I wrote one myself. For author pages, the word “author” and the nickname of the author is used. For all other pages, the default-keyword are used. You can set you own default keyword on the options-page of the plugin. Just download the zip-archive, extract the plugin-file and upload it to /wp-contents/plugins. Then go to the plugin-admin-section of your blog and press activate. 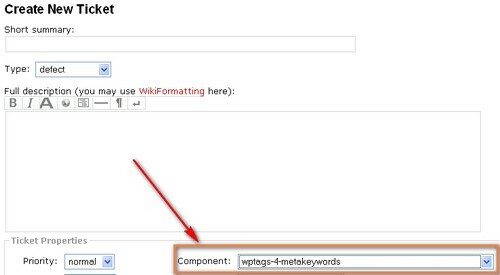 Now go to the options section and click on ‘WPtags 4 MetaKeywords’. There, you can enter some default-keywords, that are used on pages, where the plugin cannot determine automatically, which keywords to choose. WordPress 2.3 normally does not allow you to add tags to pages. But you can install a plugin to solve this problem. I recommend the Simple Tags plugin for WordPress 2.3. Among other benefits (like a highly customizable tag cloud or a ‘related posts’-feature) it enables you to tag pages. Simple Tags does not add a new tagging-system to WordPress, but builds upon the native WP-tagging. Version 0.6.2 — Added some features to the plugin’s administration-page to enhance security. Changes were inspired by this great article from David Kierznowski. Version 0.6 — Fixed a bug that raised a “Page not found error” when pages or articels were untagged. This plugin is hosted at WordPress.org, which is the right place for these matters. Of course, you can also send me an e-mail. What a great idea, wish I’d thought of it first. I wasn’t sure how I was going to use the tagging feature now I know! Hi, it seems when this plugin is enabled, my “pages” all come up as not found. Posts (including Categories, Archives, Tags lists) are fine, it is only pages that are having problem. Changing my permalink format (including just using the WordPress default) doesn’t seem to make any difference. Any idea what might be wrong? @ Zit Seng: This sounds strange. I never faced this problem during testing… Maybe it’s an incompatibility-issue with another plugin? Perhabs you could send me a list of the plugins you use (info AT weinschenker DOT name)? If you could also send me the header.php of your theme it might help to solve the problem. After you have activated the plugin, does its option-page occur in the options-section of your dashboard? Yes the WPtags 4 MetaKeywords options page does appear. I’m having the same problem as Zit Seng. All pages and untagged posts come up as not found when the plugin is enabled. The problem exists even with all other plugins disabled. Giving an untagged post a tag, allows me to open the link to that post. But since WordPress won’t let me tag pages, I was kind of stuck here. My solution was to switch to the Simple Tags plugin. I realized that it also adds the tags as keywords in the page source, even with wptags disabled, so for now I think I’ll let it stay disabled. Being a noob in coding, I learned a few things while trying to figure things out. I appreciate that, and all the work you have put into the free code. Thanks a lot & Have a nice day! That takes out the “return false,” which appears to have been causing the problem, while still only echoing the keywords if there are tags present. My problem is now gone. Hope this helps! Thank you all very much for taking part in solving this issue. Your help is always welcome and appreciated! I made some changes to the plugin inspired by your solutions. Further above on this page, I added your names in my new “Credits”-section. Untagged pages and articles are now provided with the default-keywords. I have tested it with untagged articles and pages and I think it should work. @mojo: this sounds like you are using a wordpress-version prior to 2.3 (function get_the_tags() was introduced with 2.3 and didn’t in the older versions). You should upgrade to 2.3.1 before you run my plugin. actually I’m using WordPress Multi User. I think it’s not compatible. There are some WP plugins not working under WPMU. Is there any way I could work around this problem ? maybe a little bit change in the code line2 ? Which Version of WPMU are you using? Native tagging is available for WPMU since version 1.3. I still think that the problem is that your wp-software does not support native tagging. Mine is WPMU 1.2.5, I need to upgrade it and hope it’ll work. @mojo: Did you make a successful update? Does the plugin work now? thx for your plugin! pretty cool! yes, I see. I will post a bugfix as soon as possible. The fixed Version 0.6.3 will be available in a few moments. Check the download-link above on the page. The fixed version is now online for a few days. Any problems with the fix? I have noticed that the links to this page from both the WordPress.org Plugin Directory and within your plugin itself are broken. The WP site and your plugin files are missing the “/plugins/” part of your URL for this page. I suspect this may be adversely affecting the number of people using your excellent plugin!